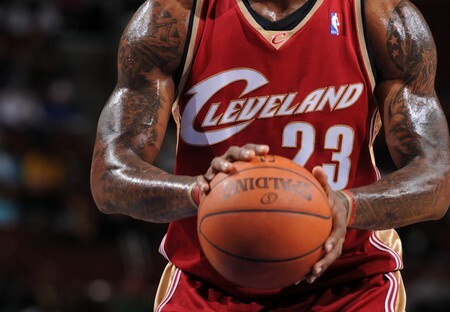 Have you ever wondered how King James’ tattoos look like up-close? 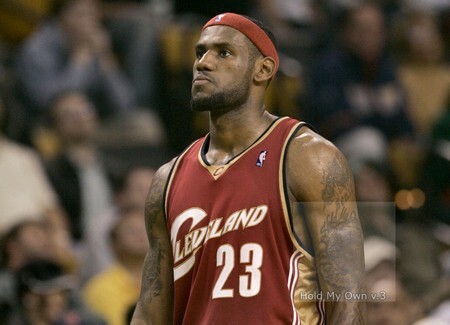 Here you’ll find out the meaning behind his ink in this complete timeline of all LeBron’s tattoos (with photographic evidence). 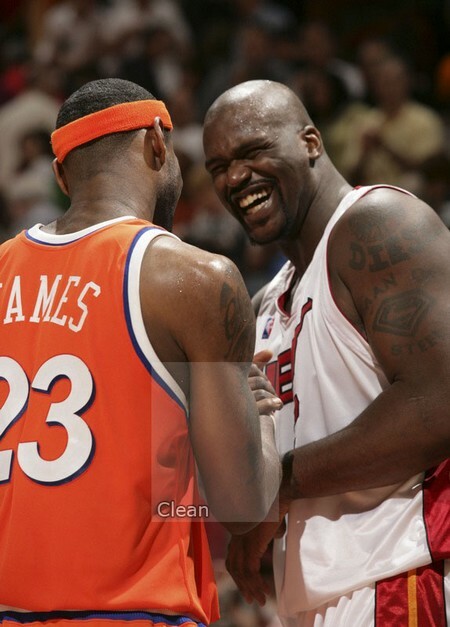 You will also learn how they have changed during the course of his professional basketball career. 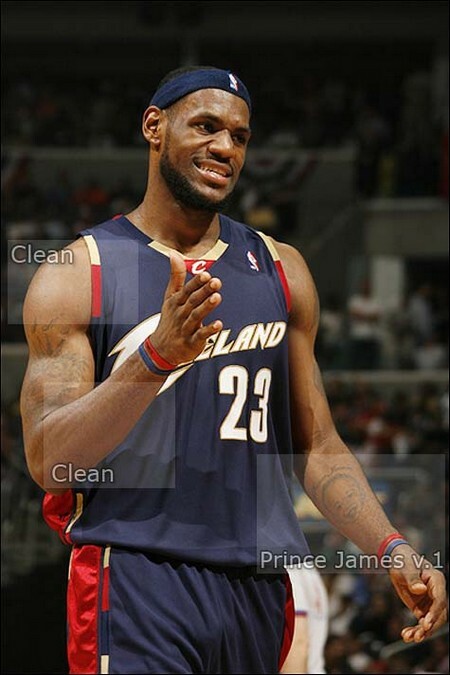 It’s very difficult to break down all of Bron’s tattoos. If anyone has some additional information (for example meanings, background, close ups), please post a comment below, or contact us. Thanks! 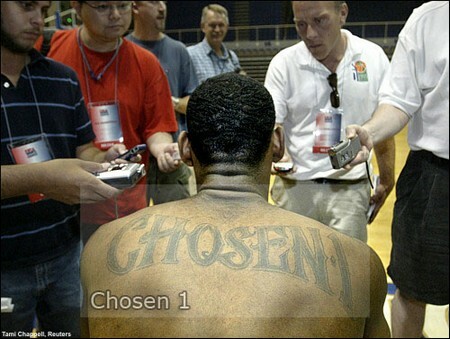 LeBron has “CHOSEN1” tattooed on his back. 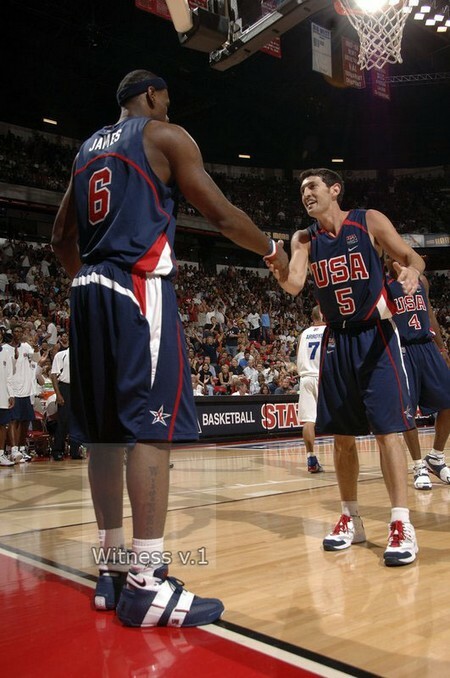 Rumors that this tattoo was there when LeBron was born remain unconfirmed. Kidding aside, he got that after Sports Illustrated gave him the title on one of the covers, while he was still in High School. 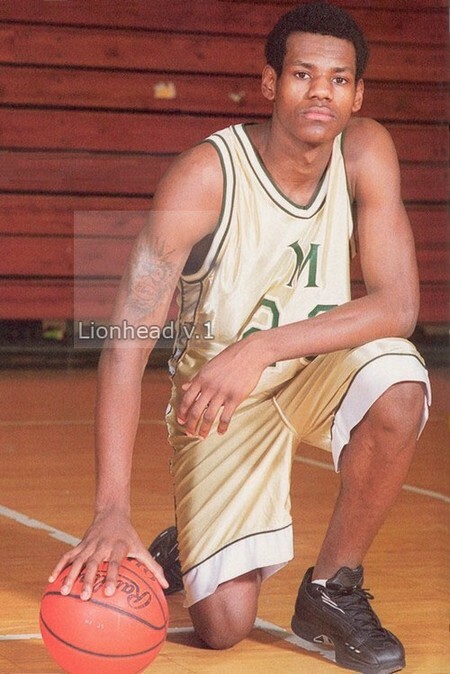 LeBron’s first arm tattoo – seems like something hairy, wearing a crown, that would later be transformed into a more distinct lion-head. 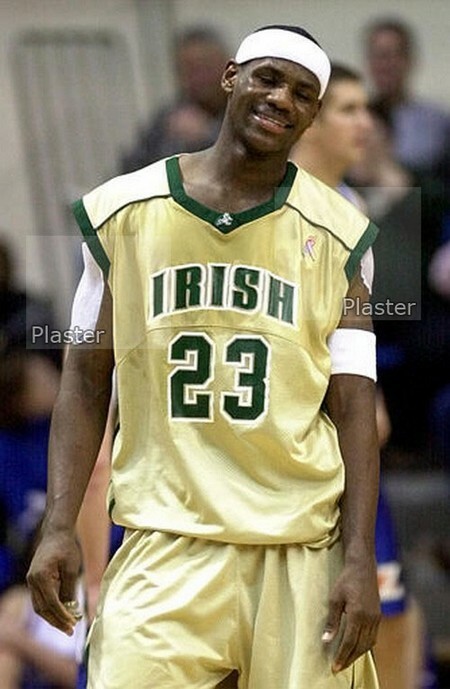 In High School, he had to wear plasters to cover up his tattoos. School’s policy. 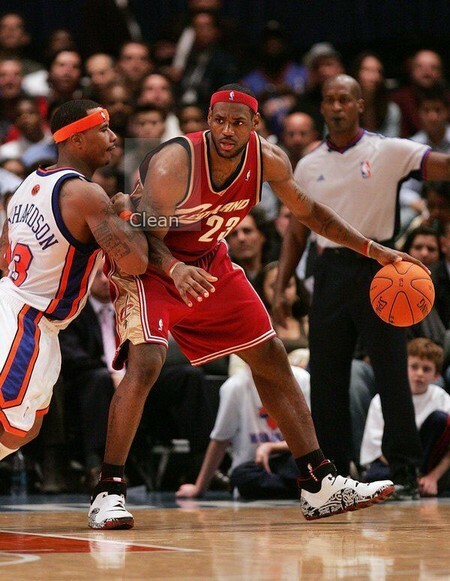 First NBA season – this is how King James came into the league. 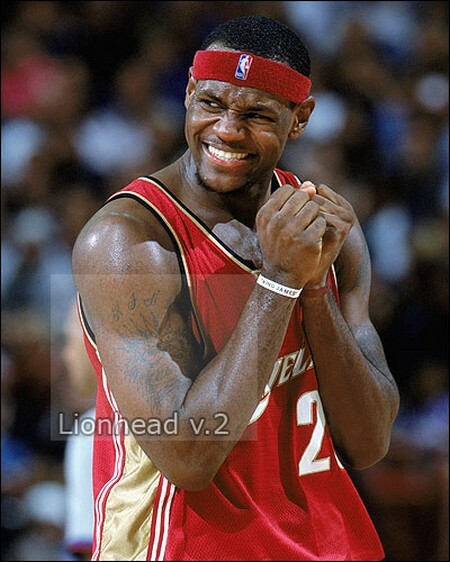 His lion-head logo got some new scripting – King (above) and James (below). 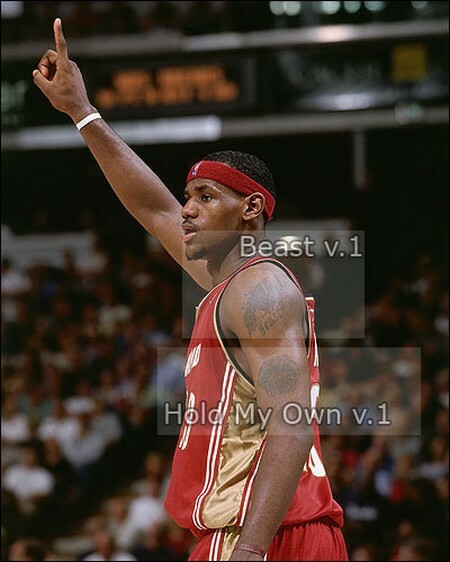 Also, his left arm has two tattoos – “Beast” and “Hold My Own”. Not a lot changed over the first two years in the NBA. In his third NBA season LeBron shows off a new tattoo – “Price James” – in honor of LeBron Jr.’s first birthday. 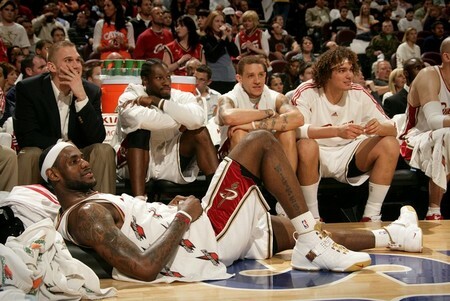 2006 Playoffs – notice there’s no WITNESS logo at this point. 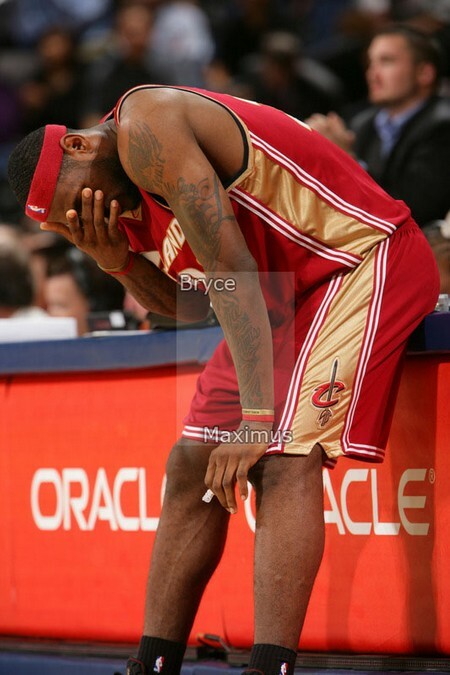 After quite a successful 2006 Playoffs run, King James got a new tattoo on his leg. 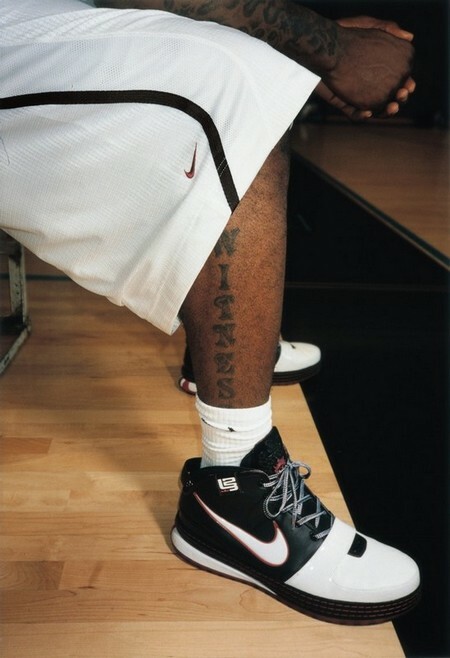 On his right calf is the word “Witness,” a reference to Nike’s famous campaign during the post-season. 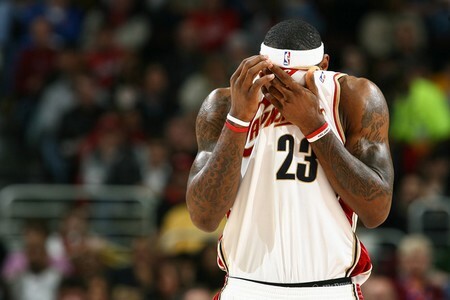 Coming into his 4th NBA season LeBron tattoo’ed a large “330” on his right forearm. It’s a reference to his hometown – Akron – area code. 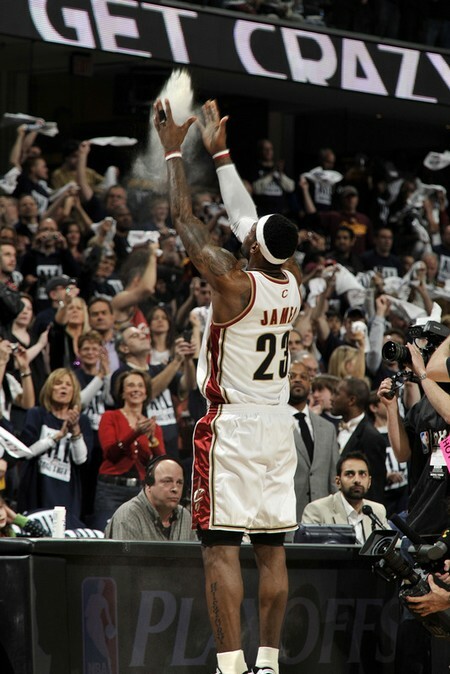 He got plenty of new tattoos in his 4th year, but at this point his right shoulder was clean from any ink. 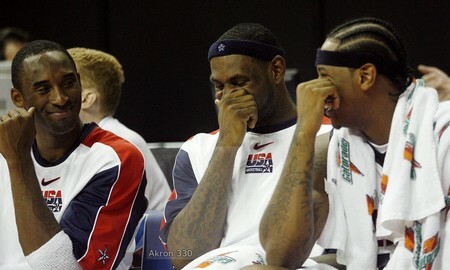 Here’s the other side of his Akron tattoo. It says “No one can see through what i am except for the one that made me” in script inside an old unrolled paper script (thanks chris23). 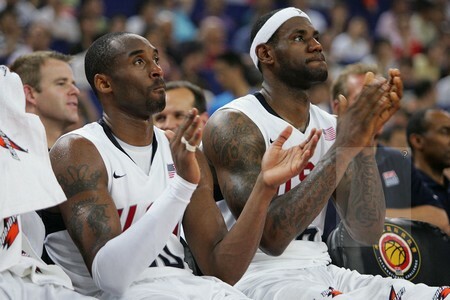 Also, notice a change in the “Hold My Own” left arm tattoo. Images of birds flying were added around this tattoo. 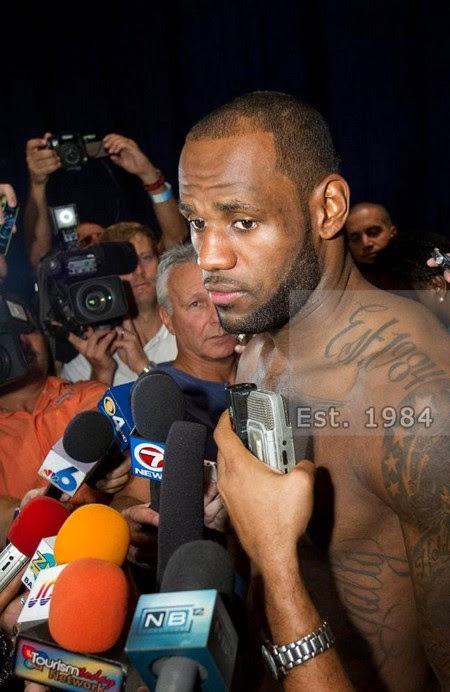 At this point LeBron didn’t have the “L” and “J” scripted on his triceps. 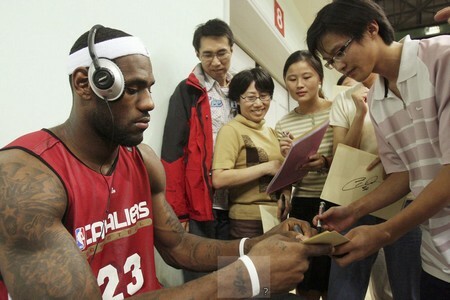 He got that during his second NBA Playoffs appearance. See the next photo. 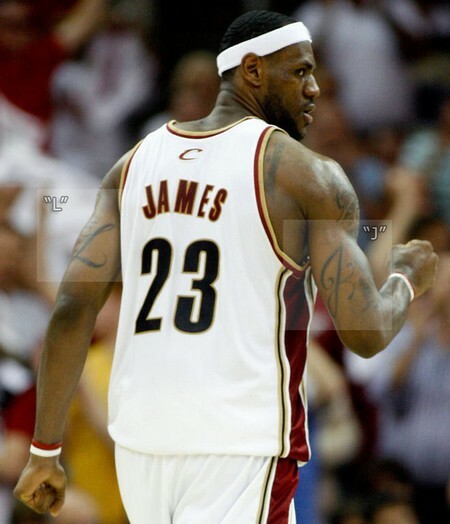 In the second round of the 2007 NBA Playoffs, during Cavaliers’ six days rest waiting for the next opponent, James got some new ink… “L” and “J” letters – his initials, of course – scripted on his triceps. 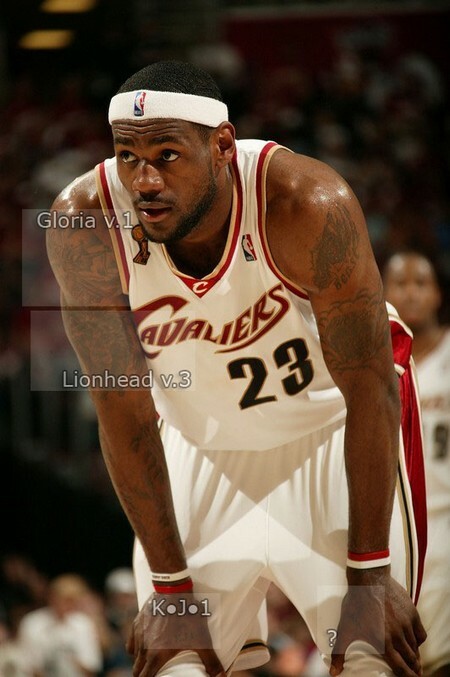 The new tattoo over the lion-head says “Gloria” in honor of Gloria James – LeBron’s mom. 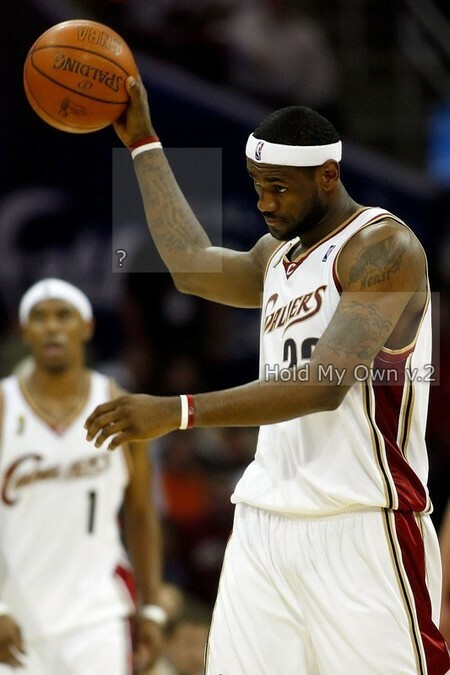 Additionally, notice two small tattoos on Bron’s hands. 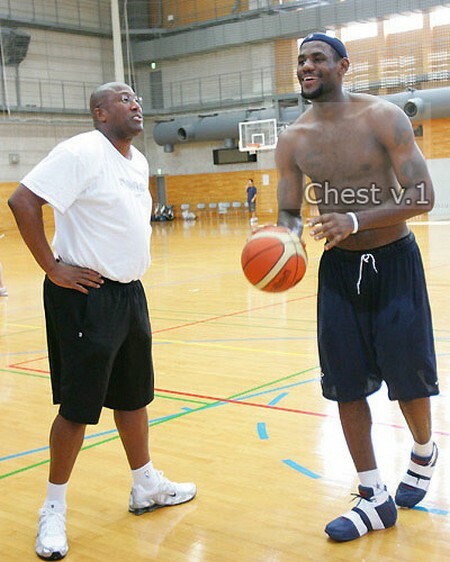 On his right hand there’s a K-J-1, which most likely means King James 1.0. 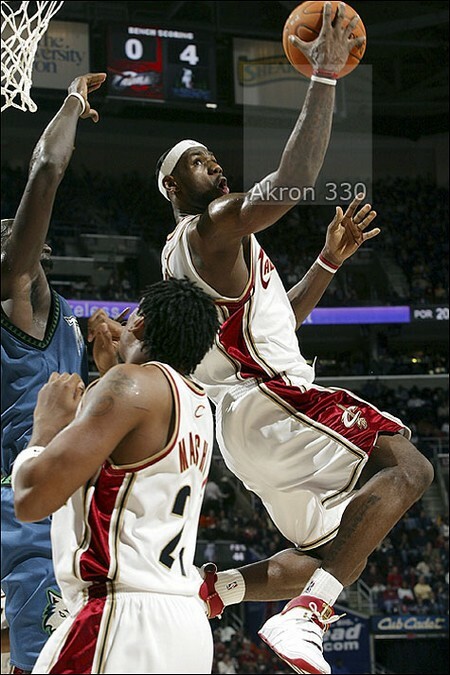 Here’s a close up of the 330 (Akron) tattoo on Bron’s right forearm. 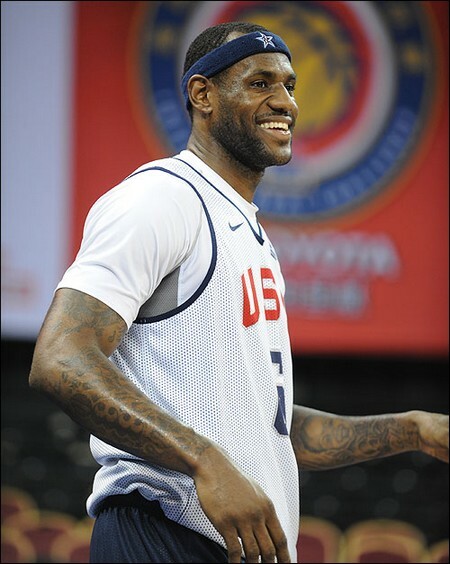 During the summer, before joining the USA Basketball Training Camp, LeBron tattooed names of his second son – Bryce Maximus – of his left forearm. 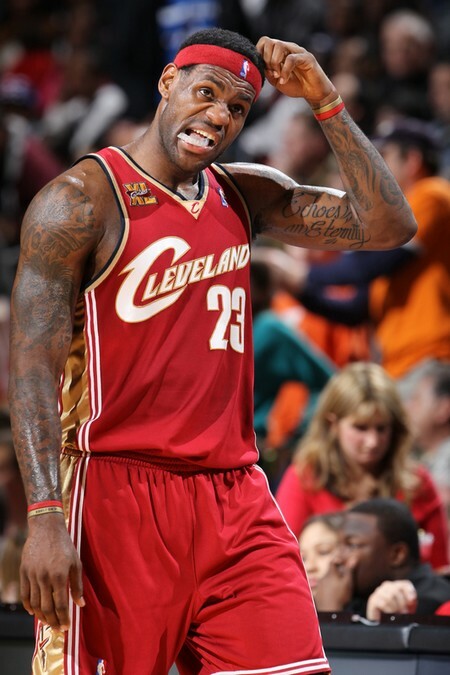 Going into his fifth NBA season, LeBron modified the “Hold My Own” tattoo and his left biceps. Above his right wrist, there’s yet another small tattoo. It is hard to interpret without a close up. Another look at the Bryce Maximus tattoo on his left forearm, commemorating the birth of King James’ second son. Both arms – close up. 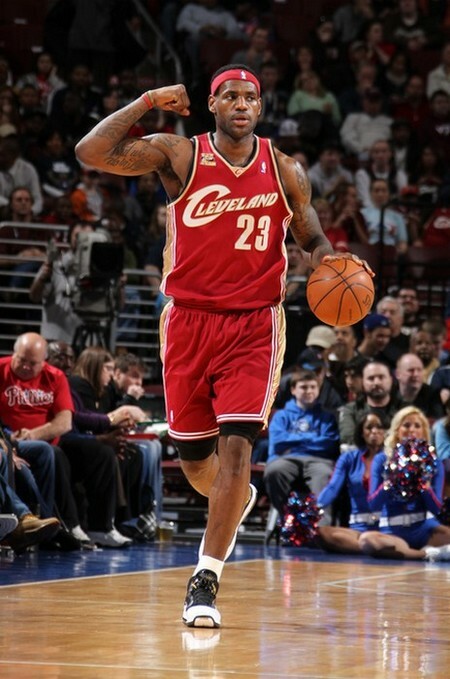 Sixth NBA season – LeBron comes in with some modifications on his left arm. The “Beast” is now surrounded with stars and the “Hold My Own” got some color. 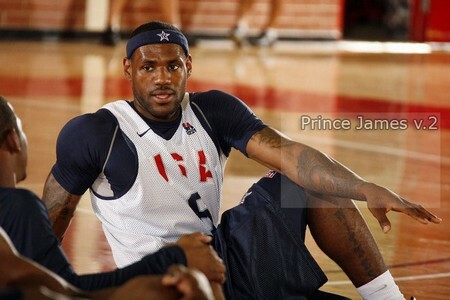 The “Prince James” tattoo has been changed as well. There’s much more graphic in the background. Back of his left forearm tattoo. Not sure what is says. Close up of James’ lion/dragon thing chest tattoo. 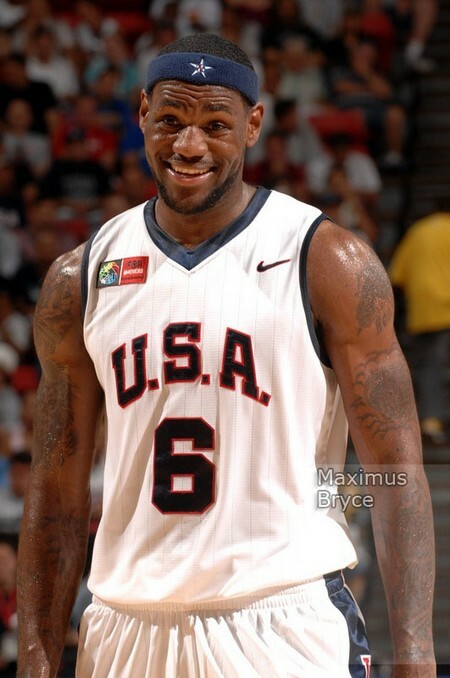 Photo taken during the 2008 Beijing Olympic Games. 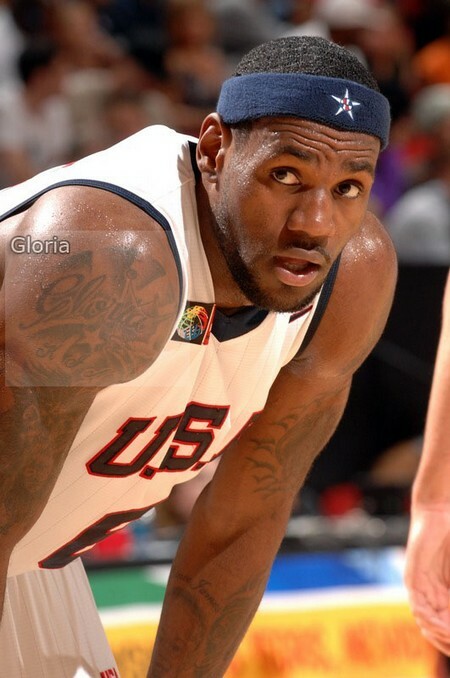 LeBron’s tattoos in full glory. 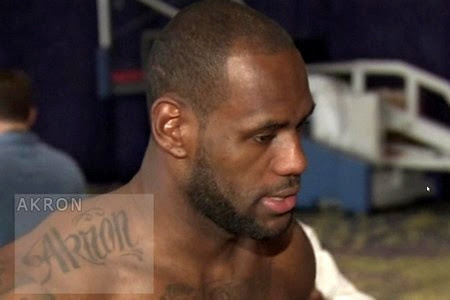 Entering the 2009 NBA Playoffs LBJ was seen with a new tattoo during one of the practice sessions in the first round. Below the lion/dragon image on his chest there’s a “Family” written in script on the right side of his abdomen. Also, there seems to be something on the other side too – “Loyalty”. So far there are no pics. 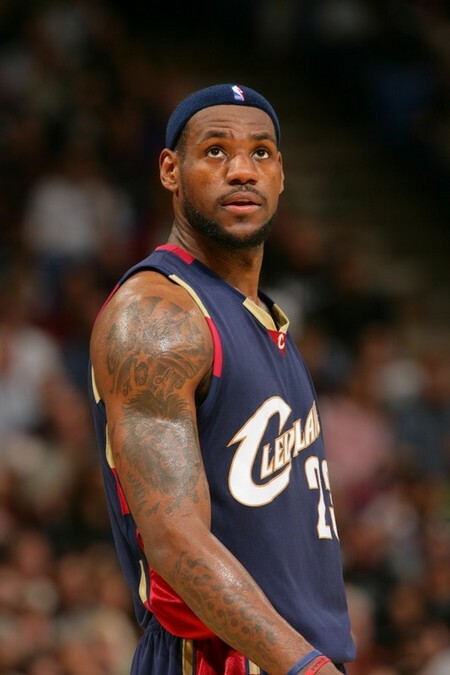 Continuing his tradition of getting new tattoos before the NBA Playoffs, LeBron James returned from his one week rest / minor ankle injury on March 12th, 2010 with a new tattoo placed on his left and right bicep. Right arm reads “What we do in life” and the left follows… “echoes in eternity”. 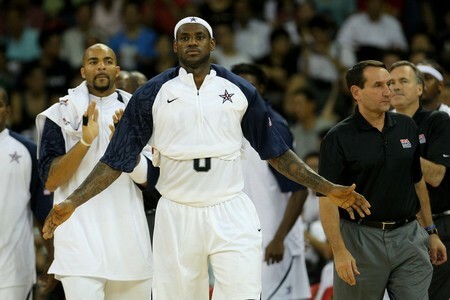 It is a quote form LeBron’s favorite movie – “Gladiator”. 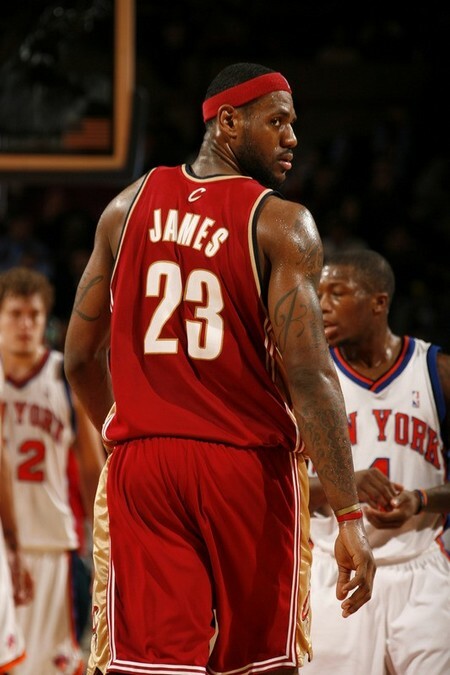 On April 17th, 2010… in the first game of the 2010 NBA Playoffs, LeBron James sported not only a new pair of shoes, but also a new tattoo on his left leg. 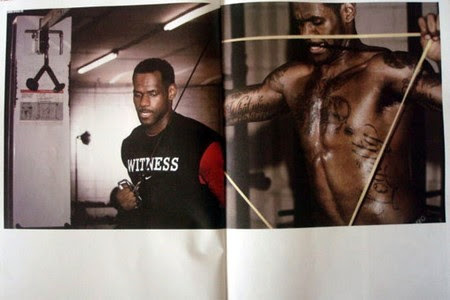 Matching the WITNESS tattoo on his right leg (see above), The King got himself HISTORY on the left. His message is now complete as it reads WITNESS HISTORY. 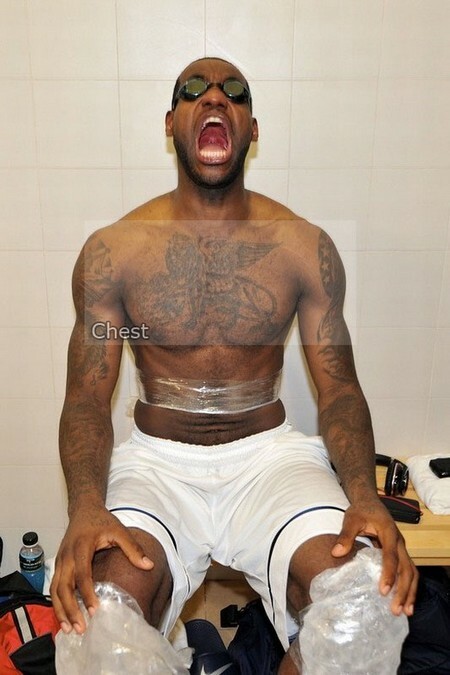 Here’s a detailed look at LeBron’s rib cage tattoos. Joining “Family” on the left side is “Loyalty” on the right side. It displays two of James’ five credos: Passion, Fearless, Tradition, Community, Family, Loyalty. 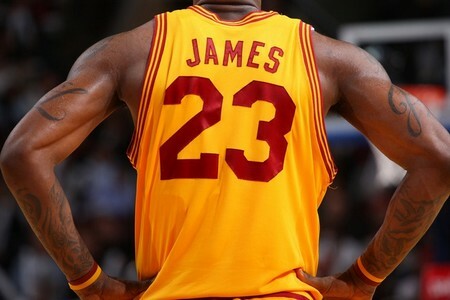 In 2013, after winning his second NBA championship, LeBron James decided to remind us all about his birthplace and the year he was born. He added two new tattoos on his collarbones. 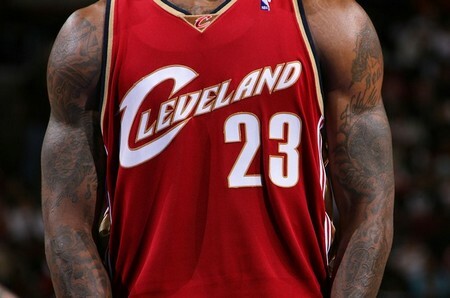 His right shoulder reads “Akron” and his left shoulder reads “Est. 1984”. 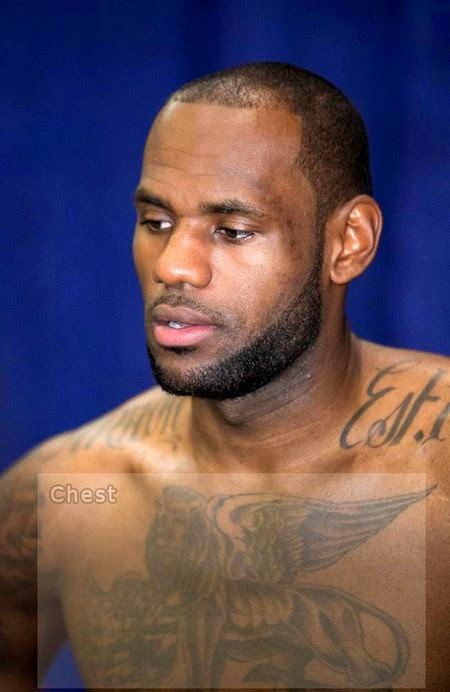 Again, it’s difficult to catch LBJ shirtless, but when you’re doing a commercial on a beach in Miami… photographers will follow.